If you believe in the importance of eating healthy while supporting your local farmers, and you want to experience a little local southern fare with a St. Augustine flair, you definitely have to try The Floridian restaurant located in the Spanish Quarter of downtown St. Augustine. Even Chef Emeril Lagasse will highly recommend you do so, as The Floridian was featured in an episode of the Cooking Channel’s Emeril’s Florida, which featured Farm-to-Table venues. Owners Jeff and Chef Genie McNally opened The Floridian in 2010 showcasing a great deal of respect for St. Augustine’s history and culture. 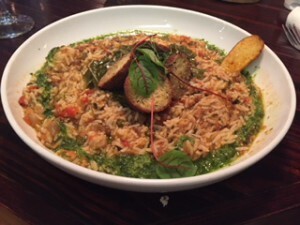 Their passion for food is evident when you peruse their menu, which provides a various array of options from seafood, steak, chicken, right down to vegetarian or gluten-free. 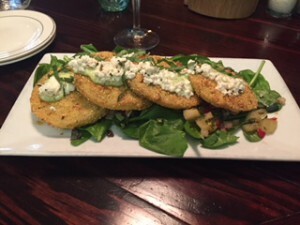 The not-your-ordinary appetizer options of Fried Green Tomatoes, Pickled Pepper Shrimps or Biscuits and Belly (to name just a few) are a great way to start your mouth to watering for the main entrée. If you have a hard time picking just one appetizer, wait until you get to the main course! The Cajuns might be known for their jambalayas and crawfish pies, but the Minorcans of St. Augustine are known for their pilaus and cornbread, which The Floridian proudly showcases in its “Shrimp and Sausage Pilau” entrée. It would be remiss to not include that the cornbread with this entrée is drizzled with hot honey. The Floridian’s ambiance does old Florida proud with its whimsical artwork, which features oranges, Spanish ships and a large Croc head picture known as “Punk Croc.” The drinks are served in Mason jars, the walls are green and there is an old raft that hangs in the main dining room. Regardless what you choose, The Floridian is sure to please. It’s a southern jewel in St. Augustine’s culinary jeweled belt and one not to be missed! Check out their website http://www.thefloridianstaug.com.